Zeus, in Greek mythology, is the chief god. Before he became “Master of the Universe” and “Guarantor of World Order”— using his chief weapon, the thunderbolt, to demonstrate his power—he had a more humble start. At least ... that’s what the ancients believed. Before he became god of heaven, sender of rain and keeper of all things sacred on Mount Olympus, Zeus was a baby who was nearly devoured by his father (Cronus, King of the Titans). Why would a father want to swallow his child? Because, according to what Cronus believed, one of his children would dethrone him. To avoid that situation, he made sure that none of his children survived. Except ... when it came to Zeus, Rhea (the child’s mother) made a switch. Instead of wrapping her baby in swaddling clothes (the narrow strips of cloth which mothers, in ancient times, used to restrict their infant’s movements), she wrapped a stone. She hid Zeus in a cave, on the island of Crete, where he was guarded by young warriors (called Curetes) who would clash their weapons whenever the child cried. Cronus was thus deceived and, true to his worry, defeated when his son became a man. Hades became ruler of the underworld. Those two - Poseidon and Hades - were actually Zeus’ brothers. Did they also survive their father’s efforts to destroy them? Apparently ... they weren’t actually dead. When he grew older, Zeus freed his brothers (who then helped him achieve victory over the Titans). 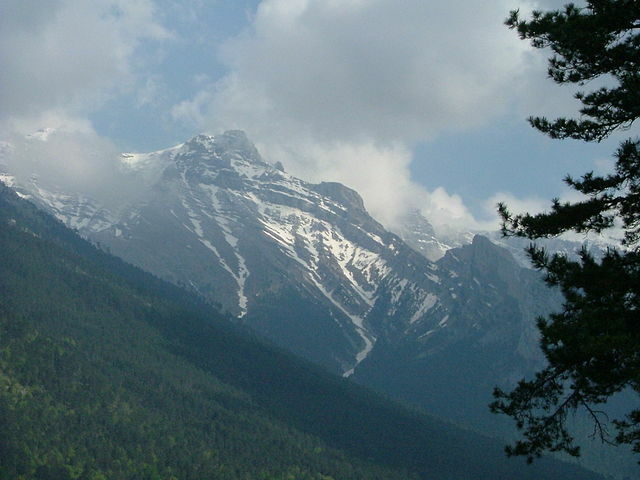 Homer, the Greek poet, tells us that Zeus—as ruler of heaven—lived on top of Mount Olympus (the highest point in Greece). That, in theory, was actually a great place for a weather god to reside. Other Greek gods lived with Zeus, at Mt. Olympus, but he was chief among them and all—including his wife, Hera—were ultimately subject to his will. Living at the top of Olympus helped Zeus in other ways. From on high, he could look down on mankind. He could see everything, which helped him to reward good and punish evil. He understood everything, which helped him to dispense justice. There wasn’t much, in the minds of ancient Greeks, that Zeus couldn’t do. To honor their chief god, the Greeks built an amazing temple for Zeus. Phidias, the most-famous sculptor of the ancient world, built a huge statue of him (which became one of the seven wonders of the ancient world). Ancient Greek artists depicted their chief god as a mature and dignified male who wore a beard. His power shone through his hefty build, and his two-most important symbols were a thunderbolt and an eagle. The impact of Zeus continues to this day. The main purpose of the ancient Olympic Games, for example, was to honor him. While the point of the original Olympics is now long-lost to history, people throughout the world still gather to celebrate the prowess of athletes. And ... while peace is not declared during the modern games, as it was during the ancient games ... athletics still has the power to temper animosity between people of differing perspectives. Phidias’ majestic statue of Zeus was long-ago ruined, as was the Great Temple of Zeus at Olympia, but we can still see some of the statues which exemplified him. The Artemision Zeus, pictured at the top of this page, is probably the most-famous of the survivors. (Archaeologists still debate whether the statue, created around 460 B.C., actually depicts Poseidon.) Today we can see it at the National Archaeological Museum in Athens. Image depicting the statue of Artemision Zeus, described above, by Tilemahos Efthimiadis. Online via Wikimedia Commons; license CC BY-SA 2.0. For a more in-depth background on Zeus, see the article about him at Pantheon.org. 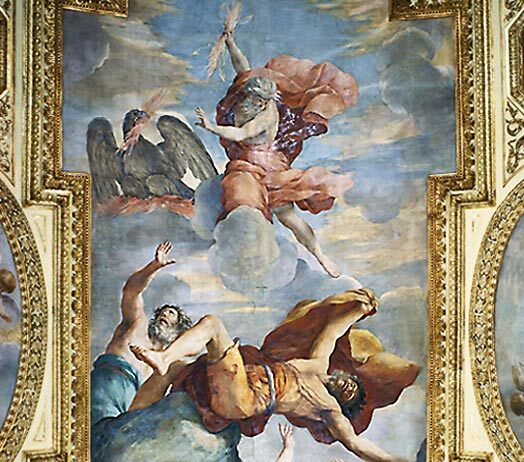 Giovanni Francesco Romanelli (1610–1662) created the fresco of Zeus/Jupiter - chief god of the ancient Greeks/Romans - depicted with both a lightning bolt and an eagle as he leads a revolt against the Titans (whose generation included his father, King Cronus). The 17th-century fresco is located in the Bibliothèque Mazarine (France’s oldest library). Image online via the BnF (the National Library of France). 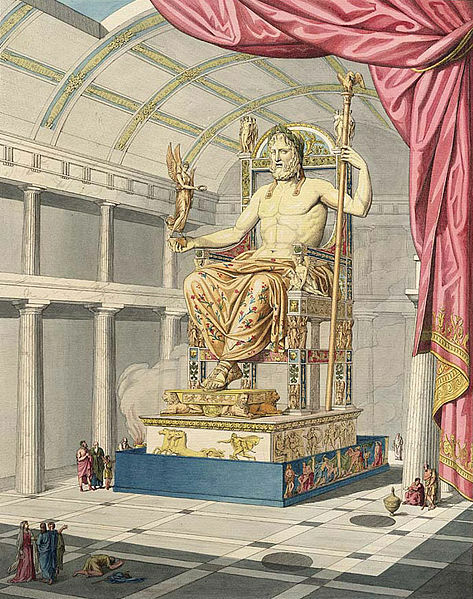 1815 artistic interpretation of the great statue of Zeus in Olympia, sculpted by Phidias, by Antoine Chrysostome Quatremère de Quincy (1755–1849). About 12 meters high, the statue was decorated with gold and ivory plus other precious stones and paintings. Online via Wikimedia Commons. Bos, Carole "Zeus - Chief God of Ancient Greece" AwesomeStories.com. Mar 18, 2015. Apr 23, 2019.